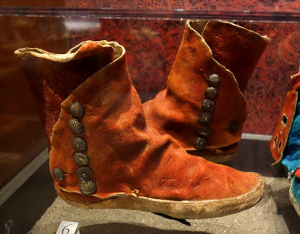 "Navajo moccasins, circa 1900-1933, with German silver buttons, Bata Sho Museum, Toronto, Ontario" by Daderot is licensed under Public Domain. Keoke, Emory Dean, and Porterfield, Kay Marie. Facts On File. American Indian History Online.